What does it say about me that I just posted a green juice recipe on Monday and here I am, two days later, shoving chocolate in your face? I made these treats for my beautiful (inside and out) friend Nicole to celebrate her birthday. Nicole lives in the U.S. currently but when she came into town recently I knew I wanted to surprise her with something sweet. She loves Snickers and my original plan was to make a Snickers Cake for her but I didn’t know if it would be very thoughtful or practical to show up to a two-person dinner party with a three-tier cake that serves sixteen. It also might have been awesome, but that’s my gluttonous side talking. Anyway, I decided to make a more reasonably-sized batch of treats so I baked my favorite brownie recipe into cupcakes, topping them with the nougat from the Snickers Cake. 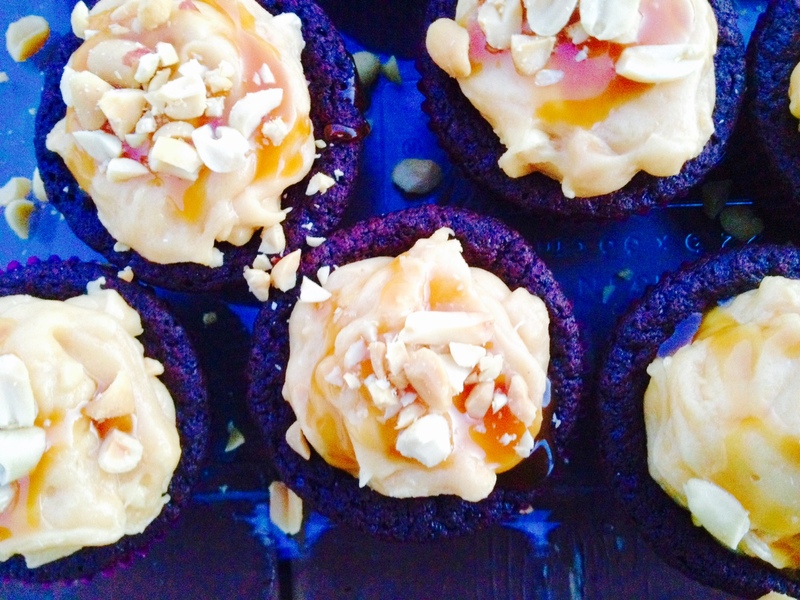 These irresistible cupcakes elicited lots of curiosity from the restaurant patrons around us. Our server asked about the recipe and the three men at the next table even expressed so much interest that Nicole very graciously gifted them one to share. With full mouths, they gave them three enthusiastic thumbs up. If you’ve ever been intimidated by that Snickers Cake, give these babies a try. They’re the much lower maintenance version and equally delish. Just be prepared to share. Mix the butter, oil and sugar together until well mixed. Stir in the eggs and vanilla, and then add in the dry ingredients, mixing until very well combined. Batter will be very thick. Divide batter evenly in the prepared cupcake tin. Bake for about 20-22 minutes, until center of cupcakes is just set. Do not over bake. Let cupcakes cool in the tin for 30 minutes, then turn out of the tin and cool for at least another 30 minutes before topping with the nougat. While cupcakes cool, make the nougat. Melt the butter in a small saucepan over medium heat. Stir in the milk and sugar. Bring it to a boil, and then turn heat back down to low and cook for 5 minutes, stirring occasionally. Remove the pan from the heat and stir in the marshmallow fluff, peanut butter and vanilla. Once combined, stir in the peanuts. Let it cool for a few minutes before topping the brownies. You want it to be warm enough to work with but not too warm that it will be sloppy. 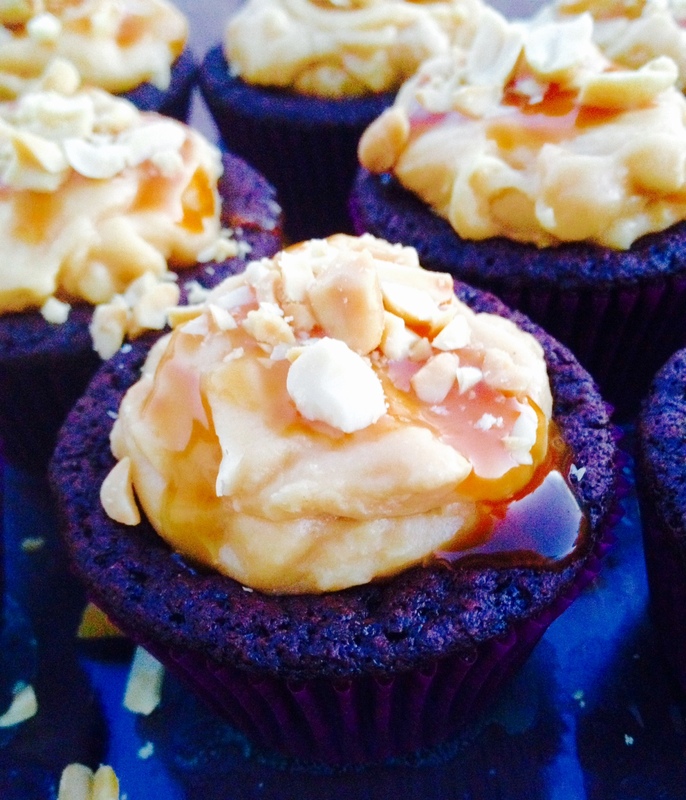 Top the cooled brownie cupcakes with the nougat. Drizzle with caramel sauce and sprinkle with extra chopped peanuts.